Greensprings West community is sold out and is not in active development by builder. 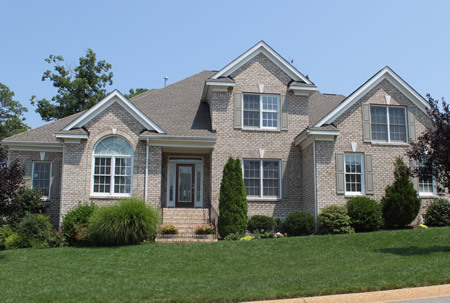 If you are interested in Greensprings West or similar new home communities, contact us today! Our agents are very familiar with new and newer construction in Williamsburg, and can identify resale opportunities in Greensprings West, as well as builder inventory available in nearby or similar communities in Williamsburg. To view 14 more pictures, interactive maps and the full, detailed description of the Greensprings West community, please Login. Homes for sale in Greensprings West offer views of the surrounding pristine land. A new home in this expansive development appeals to distinguished homebuyers who want a lavish lifestyle. Williamsburg, VA, is home to this master-planned community that allows for easy commutes to military bases like Joint Base Langley-Eustis, Camp Peary and Naval Weapons Station Yorktown. The homes for sale in this complex are inviting and nicely appointed. The lush, green land provides a perfect setting for each new home. Every house in Greensprings West may feature hardwood flooring, water views, jetted tub in master bathroom, deck, granite kitchen and bath countertops, golf course views, first floor master suite, screened porch, bonus room, fenced backyard, professional landscaping and much more. Life in this exclusive enclave is what some people can only dream of. Buyers purchasing these homes for sale get so much more than just a new home. A putter’s paradise is what awaits golfers here as they can access the Williamsburg National Golf Club that has an 18-hole championship designed by Jack Nicklaus. The club also has a pro shop, practice putting range and a restaurant for residents to enjoy. A swimming pool, tennis courts, clubhouse, walking trails and playgrounds are available at Greensprings West. Getting the lay of the land is a fun way to acclimate to America’s Historic Triangle. This region of Virginia is filled with exciting opportunities to expand horizons and enhance quality of living. Leave that new home to explore Colonial Williamsburg. The shops, eateries, landmarks and museums are just waiting for you. Busch Gardens and Water Country USA are nearby these homes for sale too. Greensprings West gives new meaning to living off the land. Homebuyers can enjoy an active lifestyle with picturesque views to boot. Take the time to get to know this neighborhood and you’ll discover what the residents here already know; this is home. Send me more information about communities similar to Greensprings West. Our agents gladly offer FREE property tours of Greensprings West, Williamsburg and homebuyer consultations to all serious buyers.